SHREVEPORT, LA — Spotlight on Opera, a prestigious summer training program now in its 12th season, is moving to Centenary this year and opening its auditions to the community for chorus, small roles, and full program participation. Auditions are set for Saturday, March 17 from 10:00 a.m. to 3:00 p.m. at the Hurley School of Music at Centenary. Community members age 15 or older are invited to audition for chorus and small roles in Spotlight on Opera’s summer 2018 shows, The Pirates of Penzance and La Boheme. All voice types are needed, but especially tenors and basses. Participants must be able to read music and memorize on their own and must be available for most regular rehearsals, all production week rehearsals, and all performances. The Pirates of Penzance, a rollicking Gilbert & Sullivan operetta filled with catchy tunes, features a big chorus of pirates, Victorian maidens, and bobbies. Each chorister will be encouraged to develop a unique character complete with name and backstory, which will be incorporated into the action. In addition to the famous aria, “Musetta’s Waltz,” Puccini’s masterpiece La Boheme contains two chorus scenes, including a short children’s chorus. The opera will be performed in Italian, but prior experience in the language is not necessary. The Pirates of Penzance will be performed July 14 and 15 and La Boheme July 28 and 29. Rehearsals will take place on weeknights from 6:00 – 9:00 p.m. with some Saturdays and Sundays and weekday afternoons as available. Each show will have two performances. Accepted singers will receive free tickets to select performances in the full Spotlight season as well as invitations to attend exclusive events such as master classes with guest artists. Each auditioner should prepare two memorized pieces to be performed with a live pianist – one opera, musical theater, oratorio, art song, or Disney song and one song of any genre. Each auditioner will also be asked to read. Auditions will be held in two sessions, from 10:00 a.m. to 1:00 p.m. and from 1:00 p.m. to 3:00 p.m.
More information and an audition application is available at centenary.edu/spotlightonopera. Completed applications should be emailed to Spotlight on Opera director Cindy Sadler at Cindy@CindySadler.com no later than Monday, March 12. 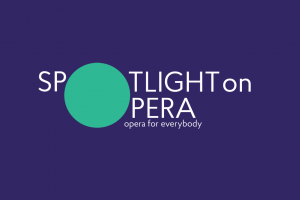 For information and an application on the complete training program, please visit SpotlightOnOpera.com.